For those living in the Northern Hemisphere, now is the best season to plant a tree. To mark March 12 as China's 40th Tree Planting Day, schools, families and work units are organizing greening rituals, with temperature climbing and frozen ground thawing. With awareness of tree planting becoming so popular in the past decades, it is no surprise that NASA released a report in February announcing the world is literally a greener place because of China, together with India, greening our planet. Based on its satellite imagery, the two countries are contributing to the largest increase in global green foliage. 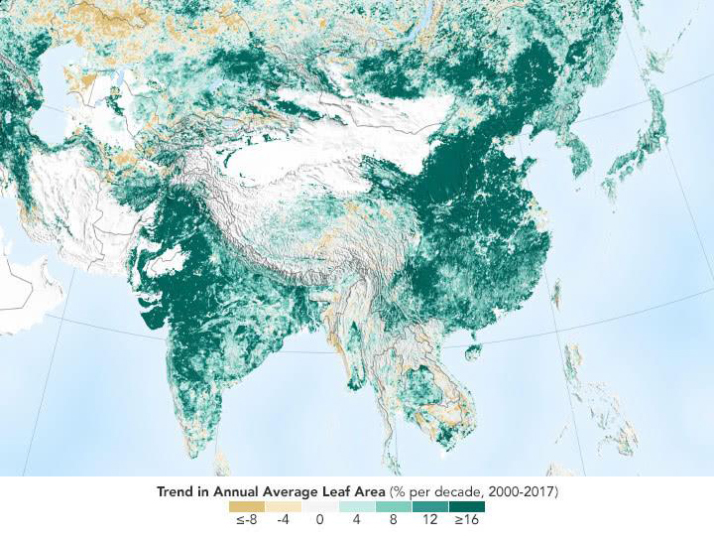 Data shows that China alone accounts for 25 percent of the global net increase in green leaf area between 2000 and 2017, in spite of the fact that the nation has only 6.6 percent of the world's vegetated area. Such an achievement on such a grand scale cannot be made solely from endeavors on Tree Planting Day. Just as it takes a village to raise a child, it takes a nation to make such a green change, working all year round with unrelenting efforts. Greening initiatives against deforestation have been established on many fronts since the People's Republic was founded in 1949. Many major ecological battles have been vigorously fought along the way in the quest to go green. Since 1956, China has established 2,750 nature reserves, accounting for 15 percent of the national land area. These reserves aim to maintain the ecosystem and provide shelter for flora and fauna. The giant panda is the species that has benefited most from conservation efforts. The much-loved animal was even removed from the endangered species list in 2016, while still having the status of vulnerable. Decades of protection brought their numbers back from the brink of extinction. 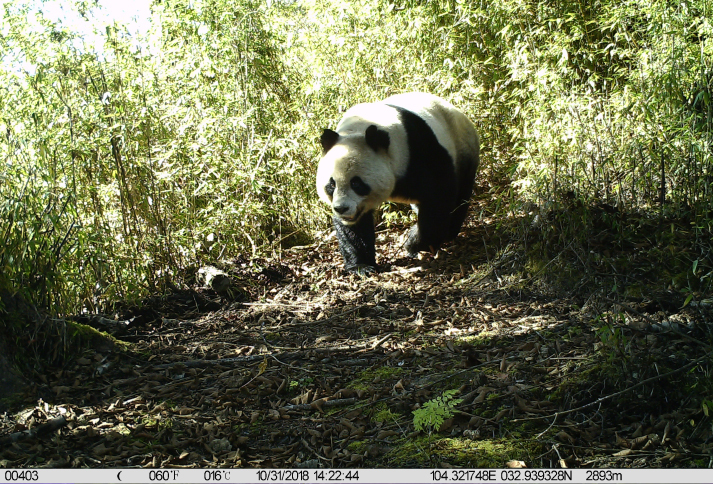 New ecological corridor programs are underway to restore and improve the pandas' habitat, which was destroyed due to traffic patterns and human activities. The year 1979 witnessed the birth of the Three-North Shelter Forest Program. Extending from the northeastern to northwestern tip of the country, the project covers more than 40 percent of China's land area and will last till 2050. The ambitious program has effectively decreased desertification of the land, reduced air pollution, and mitigated the negative effect of climate change. More positive results are expected. Chinese people once had to reclaim land from forests, grasslands, and the sea to provide food, but later realized that the price they paid was too high. Since 1999, a project to convert degraded farmland into forests and pastures has been underway. Farmers are given subsidies to give up degraded arable land for afforestation and grass plantations, and close certain mountains for forest rehabilitation. Thanks to this ecological undertaking, water and soil loss, salt-alkalization of soil, and deterioration of vegetation have drastically declined in vast areas of the country. In these battles to defend Mother Nature, being champions of the Earth may seem humble, yet the deeds of green heroes speak for themselves. 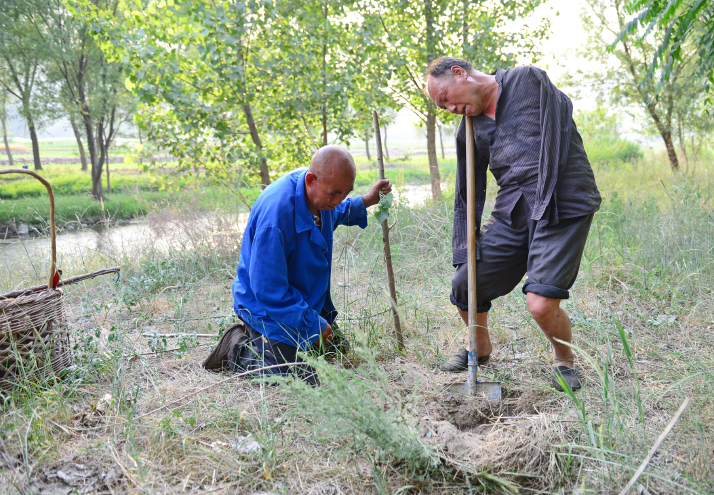 Jia Wenqi and Jia Haixia, two physically challenged farmers in their 50s from Yeli Village, Shijiazhuang, in north China's Hebei Province, planted more than 10,000 trees in wastelands over 15 years. The former is blind and latter lost both arms, yet together the two men created a forest out of nothing. "He has eyes and I have arms. Who said we cannot do this?" said Jia Wenqi, when asked how they had managed to achieve such a feat. Other unsung heroes may not have a tale to tell individually, but collectively they created one miracle one after another. The Maowusu Desert in Shaanxi Province and Inner Mongolia Autonomous Region in the north, once one of the largest deserts in the country, has been basically greened by local farmers. In 50 years, they have creatively fought against ferocious sandstorms and developed the area's agriculture and forestry. Hundreds of millions of trees they planted have turned yellow sand dunes into a green belt, thus reducing the annual soil erosion by millions of tons. In the field of ecological conservation, enterprises have more resources and skills to practice their social responsibilities. The Elion Resource Group has been striving persistently and consistently for 30 years, transforming the 6,000-square-km Kubuqi Desert in Inner Mongolia into swathes of green and lifting more than 100,000 people out of poverty in the process. Elion's Chairman, Wang Wenbiao, became the first Chinese person to receive the UN's highest environmental honor, for his determination in making desertification a lifelong career. The Saihanba Forest Farm also won UN recognition for inspiration and action. Three generations of locals in Saihanba in Hebei planted the largest artificial forest on earth. The farm, covering an area of 200 square km, is called the Green Lung in the north. It serves as a gigantic windbreaker that shelters Beijing and its adjacent areas from wind and encroaching sand, just like the Wall against White Walkers in The Game of Thrones. A man-killed desert or man-made forest, people are the masters of their land. It is through painstaking efforts that China becomes greener and leafier. On this journey full of hardships, a consensus has been reached that green mountains are mountains of gold and clear waters are streams of silver. They are the goal worth fighting for. They can be reached through each single greening action, so get your hands dirty and plant a tree.